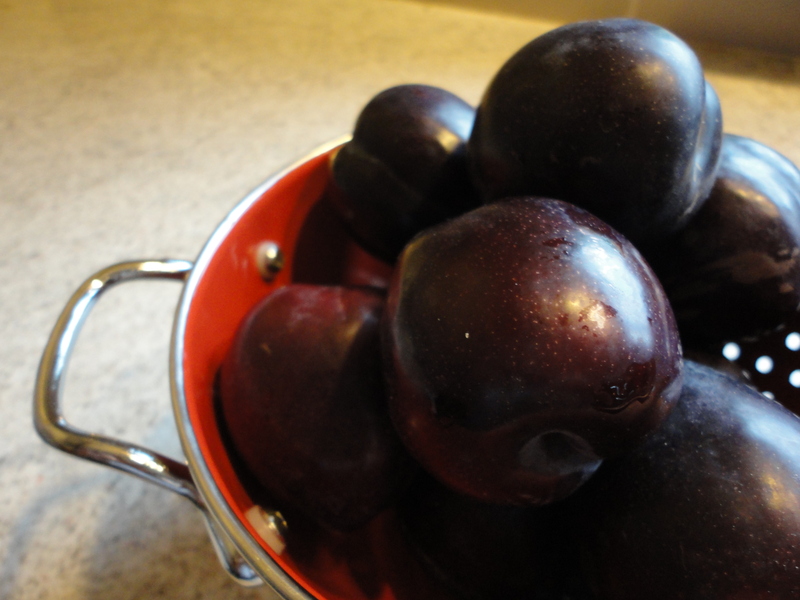 Yesterday I was surprised to find black doris plums at the Rotorua Farmers Market (held amongst the geothermal pools in Kirau Park, Ranolf Street) because I thought the season wasn’t due to start for another month. Their early arrival is perhaps explained by the a hot, if somewhat wet, summer we have had this year. I purchased a couple of kilos and schemed all the way home. In my opinion, Black Doris is the best variety of plumb for bottling. The have a deep crimson skin and flesh, a rich flavor, and they cook without going watery. The first order of business was plum sauce. For this I cracked out my trusty Alison Holst ‘The Ultimate Collection’; an utterly practical and reliable anthology of everyday recipes made from things that usually reside in the kiwi kitchen. A dear friend recommended this cook book years ago and since then I have been referring to it almost weekly. A little recipe jiggery pokery was required because I didn’t have all the spices on her list and didn’t want to strain the sauce. I don’t mind finding the odd bit of spice in sauces and prefer a thicker product. Cooking/preparation time (including bottling) 1 hr. Specialized equipment: pestle and mortar, food processor, glass bottles and lids (I used recycled salad dressing bottles). Yields approximately 1.5 L.
Wash the plum’s, count and take a note of how many you have. You need to do this so that later you can ensure that all the plum stones have been removed. Put the plums and vinegar in a large pot and place on a moderate heat with a lid. Chop/crush/grate onion, garlic, ginger and chili, and add these to the pot of plums. Crush coriander seeds, cloves, black peppercorns and cinnamon sticks in a pestle and mortar. I find it helps to also rub the mix between my fingers because it breaks down the cinnamon sticks. Place the spice mix in a heavy, dry pan. Place the pan on a moderate heat and fry spices, stirring constantly, for a couple of minuets to roast them, thus making them aromatic. When the spices waft intense aroma they are done. It is important not to burn them, so it is worth standing over them to stir. I returned this mix to my pestle and mortar for more grinding because I wanted them really fine, before adding them to the pot of plums. 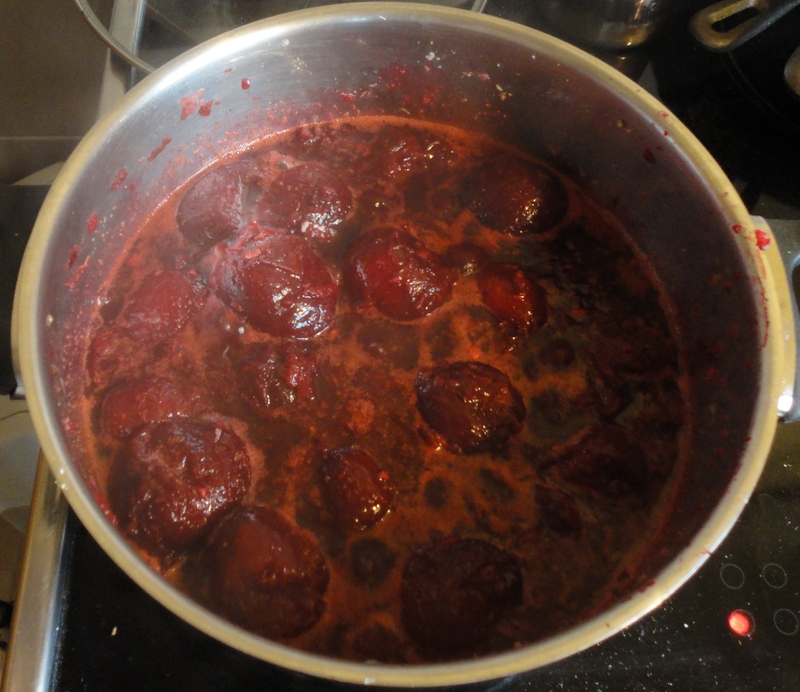 Simmer the sauce with the lid ajar for 20 – 30 minutes or until the plums are soft. Fish out all of the stones (I used a spoon to do this). Add the sugar and salt and bring the mix back to a boil. Taste check here and remember that the sauce will taste milder when served cold than it tastes hot. Adjust – more sugar, more chili, more salt, more cinnamon? Turn off the heat and allow to cool for 15 minutes at least. Puree the sauce in batches with a blade attachment in a food processor. Take care, if the mix has not been cooled you will crack your food processor bowl with the hot liquid. I returned the sauce to the pot and bought it back to the boil before pouring it into hot, sterilized glass jars and capping with equally hot, sterilized lids. As with all bottling, allow the jars to cool in a draft free location. If you doubt the seal on your bottles, dip the tops in wax after they have cooled. 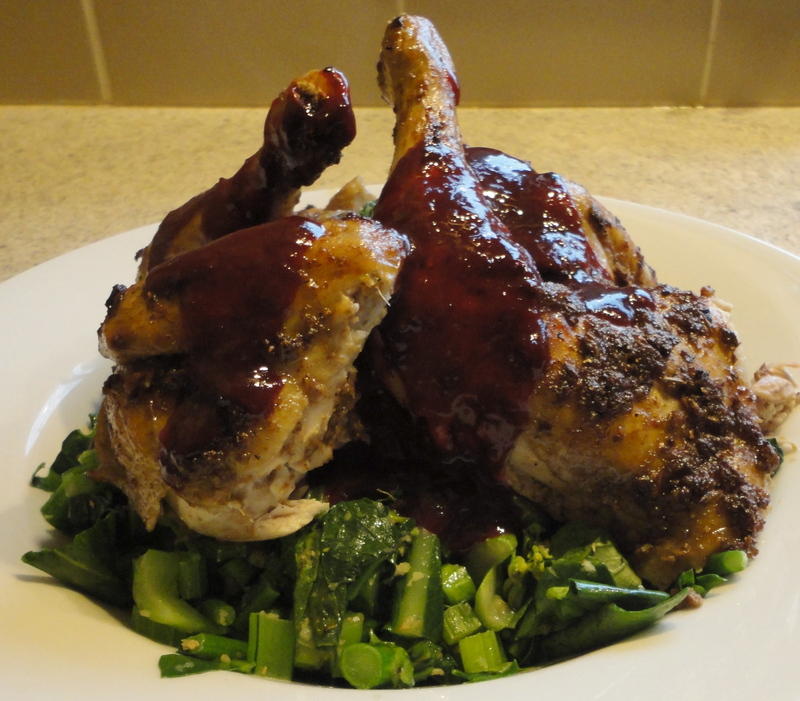 Spicy black doris plum sauce served on roasted free-range chicken that had been marinated in a masala rub comprising ginger, garlic, chili, fennel seed, coriander seed and garam masala, and accompanied by market fresh asian vegetables (yu choi sum). I drizzled some of this sauce on top of the roast chicken and asian vegetables I made for dinner at the same time (pictured). It would also go well with almost any other kind of meat (particularly pork) and most cheese dishes. 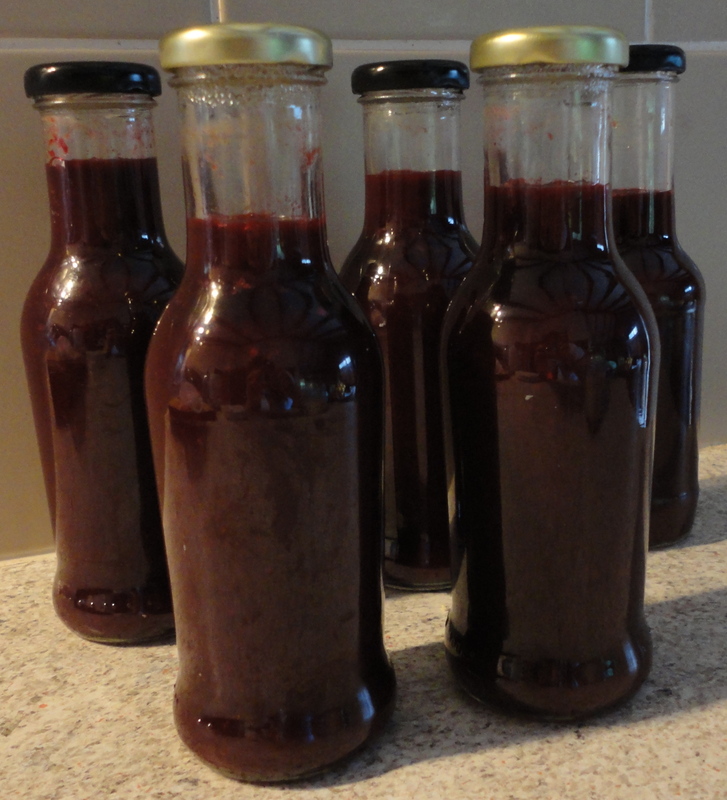 Sauces like these will ferment in the cupboard over time and should last until next season if well bottled. The last 1/2 kg of plums I will just stew and pop in the fridge. I love having this kind of thing on hand because it is yummy on yogurt, cereal, ice cream, in pies or even in smoothies. foodscratch · Food my grandmother would have loved.